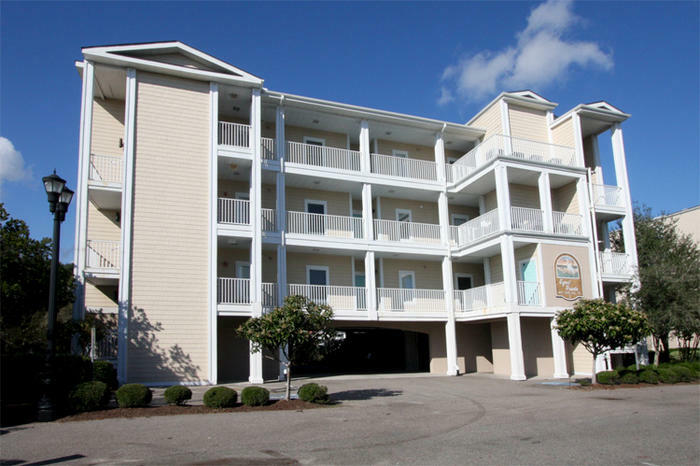 The kids will appreciate having a DVD player in the comfort of your North Myrtle Beach rental so they can see their favorite movies while you relax on the marsh view balcony and enjoy the sights and sounds of the North Myrtle Beach. There is room for all six people to spread out and have some privacy and some space during your North Myrtle Beach vacation at Egret Pointe South. The screened balcony is a much-used part of these condos in North Myrtle Beach, South Carolina because the sunshine is so inviting. Access the balconies at Egret Pointe South through the living room and also the master bedroom. Watch the peaceful sunset from your balcony and do a little bird watching, too. The salt marsh is a wildlife haven and you never know what you might see as you relax on the balcony at Egret Pointe South. The swimming pool for guests of Egret Pointe South is right across the street. The pool is fenced in and there are tables, chairs and an umbrella scattered all around this sun deck so you can fully enjoy the sparkling blue water and sunshine. This North Myrtle Beach resort is in a terrific location as you are blocks from the white sandy beaches and right on the salt marsh. The views are spectacular and the proximity to the beach is divine. Catch an oceanfront sunrise one day of your North Myrtle Beach vacation. Wake up early and put some freshly brewed coffee in a cup and saunter to the beachfront. You might want to take a camera with you because the oceanfront sunrises in North Myrtle Beach, South Carolina are nothing short of spectacular. Look to the north and see if you can spy the closely located Cherry Grove Fishing Pier. To the south is Myrtle Beach and the newly opened Myrtle Beach SkyWheel. In between these two amusements are a bevy of attractions for the whole family. Shopping, dining, live entertainment theatres, golf and water sports are everywhere in the Myrtle Beach area. There are outlet malls, beachwear stores and charming shopping villages nestled around a lake and under the trees. Many of these shopping destinations are right next door to fabulous restaurants. Finding a terrific place to eat is easy because the Myrtle Beach area has more than 1,500 restaurants. Take the family to a seafood buffet that includes all-you-can-eat crab legs. Or dine on the waterfront where you can see the Atlantic Ocean, the salt marsh inlet or the Intracoastal Waterway. The live entertainment theatres offer wonderful productions that usually involve singing and dancing. From Carolina Opry and Alabama Theatre to Pirates Voyage and Medieval Times, there is a show out there for your whole family. Myrtle Beach golf courses are plentiful. There are more than 100 around town and they are all fun to play. Many are award-winning and most feature a club house with a pro shop, bar and grill and a driving range. When you want to play in the water and get a little wet, then venture out to the nearby water sports. Parasailing, Sea Doo rentals, banana boat rides and boat rentals are some of the ways you can enjoy the water during your North Myrtle Beach vacation. You might also go pier fishing, deep-sea fishing in the Gulf Stream or kayaking in the inlet. Bring your bathing suit as you will probably wear it most days of your North Myrtle Beach vacation at Egret Pointe South.